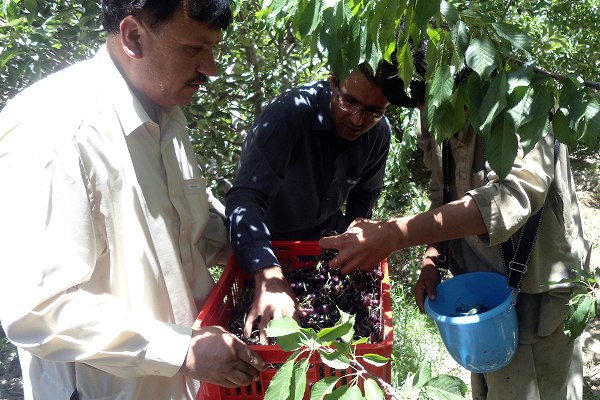 Abdual Qahir (left), president of the Horticulture Growers and Community Development, and two farmers harvest cherries using field boxes introduced by PACCD. Balochistan is the top-producing cherry region in Pakistan, and demand for cherries has been increasing for several years. However, cherries are difficult to grow and are highly perishable — often with a shelf life of less than 15 days. Up to 30 percent of the fruit is spoiled before it ever reaches market because of inferior packaging and a lack of knowledge about post-harvesting techniques. As a result, farmers have not been able to keep up with demand. Typical fruit packaging in Balochistan is made of low-quality cardboard. These cardboard boxes are rough on the inside, which damages the soft fruit, reducing further the shelf life and the quality of the cherries and, in turn, their appeal to consumers. The Winrock-implemented Pakistan Agriculture and Cold Chain Development (PACCD) project — funded by the U.S. Department of Agriculture — introduced cherry farmers to high-quality, transparent cherry packaging, which utilizes holes for air circulation and better protects the fruit during transport. The boxes are designed for storage in cold stores and refrigerated containers that are used to lengthen the shelf life of produce, whereas common cardboard packages are not intended for cold stores and cannot effectively withstand transportation. With the improved packaging, farmers can now send their produce to national markets, such as the ones in Multan, Lahore, Faisalabad, and Islamabad. Additionally, the improved packaging has reduced post-harvest losses by 15 percent, allowing farmers to sell even more high-quality cherries. In 2013, PACCD distributed 36,000 boxes to 120 cherry producers and required each recipient to contribute 50 percent in matching funds. Local associations such as the Horticulture Growers and Community Development and the Balochistan Horticulture Cooperative Society assisted with the selection of recipients and the distribution process. The increased quality and appeal of the newly packaged cherries has led to higher farmer incomes. As a result, the demand for transparent boxes in the cherry farming community is increasing sharply. However, producers aren’t the only ones who benefit from the improved packaging. Because the boxes are transparent, retailers are better able to assess the quality of the fruit, and consumers can see the quality of the cherries at a glance, reducing the need to search through containers. Abdul Malik is a cherry farmer in Ziarat who lives with his four brothers and six children. Before he learned about PACCD, Abdul used cardboard cartons to collect, transport, and sell his cherries for 200 Rs ($2 USD) per carton. Last year, Abdul bought 300 transparent boxes and saw an improvement in the quality of his produce and his income. Based on last year’s success, he bought 1,000 transparent boxes and is now able to sell his cherries for 250 Rs ($2.50 USD) per box. Even with the extra expense, the transparent packaging increased his profit by more than 10 percent. “We have a culture of giving gifts because love increases when you give gifts,” Abdul says, adding that the more attractive packaging makes for a better gift as he sends these cherry boxes to his family, friends, and business connections. Abdual Qahir, president of the Horticulture Growers and Community Development says, “It took only one season for farmers to understand the profitability of something they had never seen before.” To this he adds proudly that they will need thousands more boxes in order to keep up with the rising demands among cherry farmers.